For other uses, see Ryan Airlines (disambiguation). The Ryan Aeronautical Company was founded by T. Claude Ryan in San Diego, California in 1934. It became part of Teledyne in 1969, and of Northrop Grumman when the latter company purchased Teledyne in 1999. Ryan built several historically and technically significant aircraft, including four innovative V/STOL designs, but its most successful production aircraft was the Ryan Firebee line of unmanned drones used as target drones and unmanned air vehicles. In 1922, T.C. Ryan founded a flying service in San Diego that would lead to several aviation ventures bearing the Ryan name, including Ryan Airlines founded in 1925. T.C. 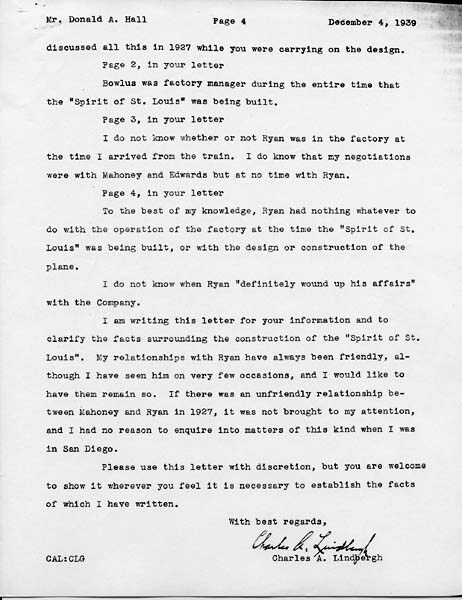 Ryan, previously best known for building Charles Lindbergh's transatlantic Spirit of St. Louis, actually had no part in building the famous plane. Ryan had been owner or partner in several previous companies, one of which also bore the name Ryan Aeronautical. 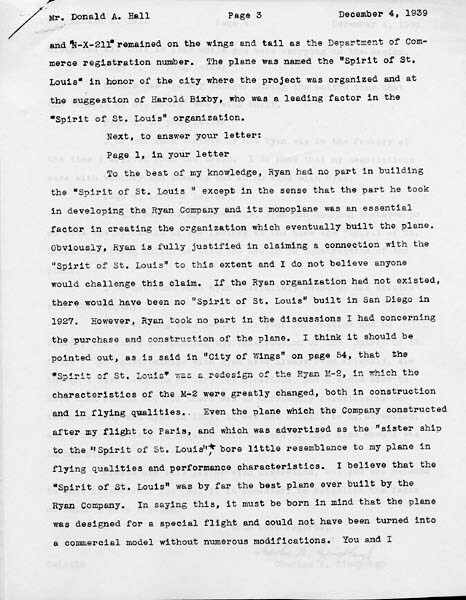 The Spirit of St. Louis was not built by the final Ryan Aeronautical entity. In 1937 and 1938 a second civilian aircraft model was introduced, the Ryan SCW-145 for Sport Coupe, Warner 145 horsepower (108 kW) engine. The SCW was a larger three-seater aircraft with a sliding canopy and side-by-side front seating. The prototype SCW was originally powered by a Menasco engine, however prototype testing revealed that more power was needed, hence the move to the Warner 145 hp (108 kW), 7-cylinder radial engine for production models. Thirteen examples of the SCW were built, although the last one was assembled from surplus parts decades after the initial production run was finished. Interest from the United States Army Air Corps followed. The Menasco engines proved unreliable, and instead Kinner radial engines were fitted. Aircraft were produced as the PT-16 (15 built); PT-20 (30 built); PT-21 (100 USAAF, 100 USN); and finally as the definitive PT-22 Recruit (1,048 built) ordered in 1941 as pilot training began its rapid expansion. Ryan also pioneered STOL techniques in its YO-51 Dragonfly observation craft. Three prototypes were built, but no USAAF order materialized. Ryan became involved in the missile and unmanned aircraft fields, developing the Ryan Firebee unmanned target drone, the Ryan Firebird (the first American air-to-air missile) among others, as well as a number of experimental and research aircraft. In the 1950s, Ryan was a pioneer in jet vertical flight with the X-13 Vertijet, a tail-sitting jet with a delta wing which was not used in production designs. In the early 1960s, Ryan built the XV-5 Vertifan for the U.S. Army, which used wing- and nose-mounted lift vanes for V/STOL vertical flight. It was flown, crashing after ingesting a test rescue dummy in its fans, and was not made into a production aircraft. Other Ryan V/STOL designs included the VZ-3 Vertiplane and the YO-51 Dragonfly. Mural on the site of Teledyne Ryan in San Diego depicting many of the Ryan products. ^ Gill Rob Wilson (July 1954). "Genealogy of American Aircraft". Flying Magazine. 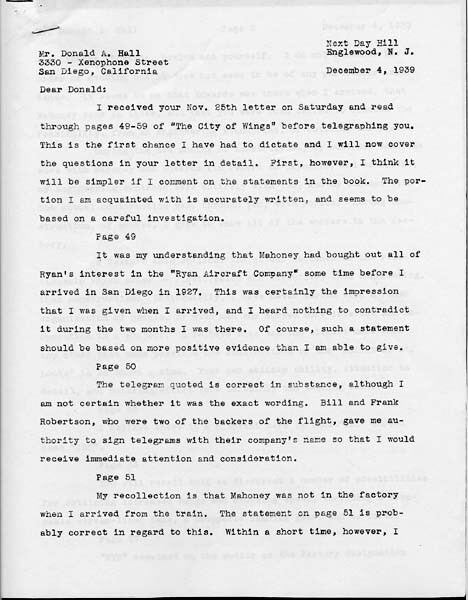 ^ "Image: letter_fromCal01-1939-post1970.jpg, (468 × 600 px)". charleslindbergh.com. Retrieved 2015-09-04. 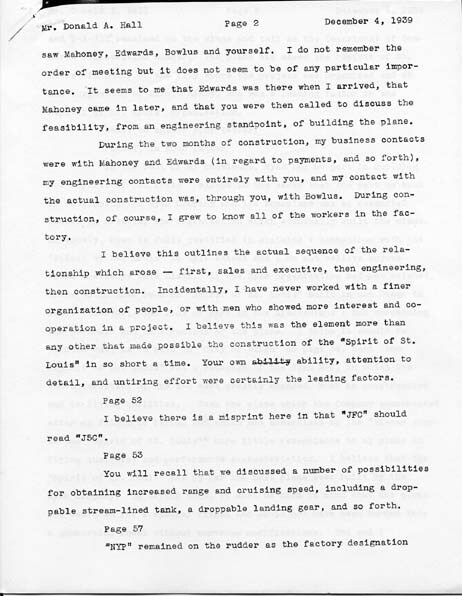 ^ "Image: letter_fromCal02-1939-post1970.jpg, (462 × 596 px)". charleslindbergh.com. Retrieved 2015-09-04. ^ "Image: letter_fromCal03-1939-post1970.jpg, (466 × 600 px)". charleslindbergh.com. Retrieved 2015-09-04. ^ "Image: letter_fromCal04-1939-post1970.jpg, (462 × 600 px)". charleslindbergh.com. Retrieved 2015-09-04. This page was last edited on 23 February 2018, at 22:24 (UTC).